These brass inserts are molded into the tank. One is commonly used for the fuel pick up and the other one is for the return diesel line. 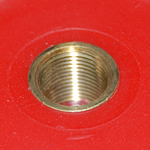 A brass tail is supplied with the pick up. The tail fits a 5/16″ hose. A brass tail is supplied with the tank. The tail fits a 5/16″ hose.